Politics can be Man’s highest calling or the dirtiest business known to Man … and sometimes it can be both. In 2018, we saw the heights (and depths) to which politics (for Man is a Political Animal) can ascend (or descend) to. Indeed, this was a whirlwind year for domestic, international, and local politics. In the political arena, each citizen has a voice — and during 2018, all our voices were raised as one, together in an American chorus, singing that old familiar tune: DEMOCRACY. It’s pretty interesting, when you think about it: Politics is the art of the possible, and any citizen can make a name for him- or herself by entering politics. Does that mean the art of the possible lies dormant within each of us? Sounds hard to believe, but it’s true. And that’s why, no matter if you’re a Democrat or a Republican, at the end of the day, we’re all Americans and we love politics … because who knows what’s possible? Everybody can get along if they have the same values. 3. Can we find a solution? Some say we are living in a Golden Age of Television. After giving this my full consideration, I tend to agree. Think about it: Some TV shows are even more complicated and frustrating than movies, while other TV shows help us see outside our own experience so we can understand what it’s like to be somebody we don’t want to be. All these elements add up to a new era defined by something I have decided to call Televised Excellence. We shouldn’t take this new era (“Televised Excellence Era”) for granted … because if we do, it might slip through our fingers — like a remote control when our fingers are greasy from eating POPCORN! 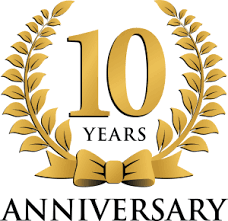 Simple question: Do you remember what you were doing ten years ago? Another simple question: Ten years ago, did you change the world? I’m proud to say that I can — and always will — answer “Yes” to both these simple questions. Simply put, ten years ago, in December 2008, I began a tradition unlike any other. A new tradition that has since stood the test of time, gone toe-to-toe against other traditions … and left them gasping for air with blood streaming out of their noses. A tradition that has made the internet a better place than ever before. 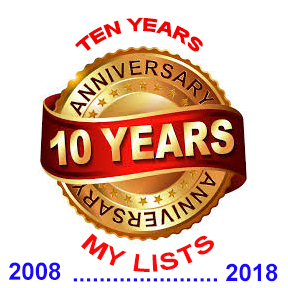 Ten years ago, I started my year-end lists! I must admit that I did not invent the tradition of year-end (sometimes called “year-in-review”) lists. Indeed, I have admitted this before, in a now-classic essay on the matter that I wrote exclusively for my web site. However, in the ten years I’ve been making these lists, I have elevated this humdrum practice into a higher form of intelligence. In fact, I have yet to see ANYONE or ANY PUBLICATION do a better job than the job I am doing when it comes to summing up the highs and lows of a year via lists. In fact, I would put my WORST year-end list up against a major publication’s BEST year-end list and wager my list would come out on top. That’s how confident I am in my lists. It feels good … to make something you’re proud of. 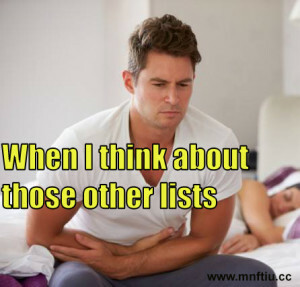 And therefore it feels good … for me to make my lists. Things only got better from there, as I spent the next DECADE paying close attention to every element of society, culture, politics, trends, and the human experience in order to definitely quantify them at the end of every year. With ironclad judgment and a brilliant mind, I was able to transform the overwhelming, unmanageable chaos of reality into easily digestible lists that could be read exclusively on mnftiu.cc (my web site). And that, my friends, is wonderful … I don’t need to put it on a list, you know it’s true in your gut. Reviewing this list now, we notice that the entire year of 2012 has been simply and elegantly captured in these palindromes which can be read backwards and forwards. As I have proved above, my lists are the best. It has been said by poets and historians that “The Best Will Someday Not Be The Best Anymore,” but it’s my hope and intention to prove that false in the highest degree. How will I achieve this? By continuing to bring my readers the highest-quality lists on any media platform, without fear and without favors, focused only on celebrating the best elements of each year (in a given category that will be the focus of each respective list). “Have I got your attention? Good. Now PAY ATTENTION EVEN MORE” because what I’m going to say may surprise you: I have no intention of stopping or not doing my lists every year. I realize that these lists are a holiday tradition unlike any other, an extreme form of joy and release for many of my readers — perhaps even you! A wise man once said, “With great problems come great responsibilities,” and since the problem of my lists are that they are so enjoyable, the responsibility that I have is, simply, to make more enjoyable lists. Why is this significant? Because we live in a world of flux. A world of change and disruption. What is here today, may be “gone tomorrow.” Amidst this every-flowing landscape, my lists will stand tall, like cliffs above a churning sea. And so, without any further ado, it is my great pleasure to once again bring you my year-end lists! Humans, it is often said, are animals. And whether this statement is true or false, we can all agree that humans share a lot in common with many animals. Perhaps no year has been more animal-centric than 2017. After all, this was the most recent year for all of animal life — including humans (or not)! From baby zoo animals that became internet memes, to the oldest animals who still kill humans and hunger for their flesh, this was a year for all animals … or you could even say, “All creatures great and small.” And yes, Virginia, a creature is a type of animal. So let’s visit the zoo and howl at the moon while we celebrate the TOP TEN ANIMALS OF 2017! 3. 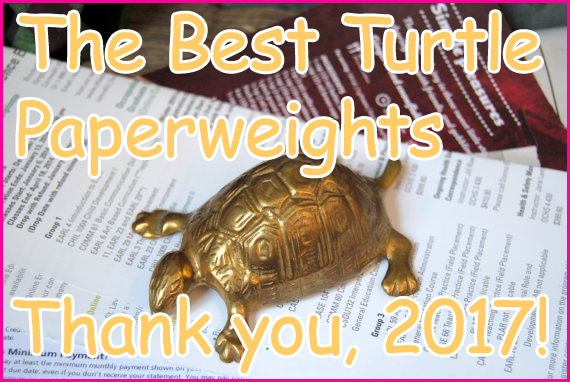 Will a major award be won by a turtle paperweight someday? Some say journalism is the lifeblood of democracy. And since American democracy has never been healthier than it is right now, we all owe a debt of gratitude to the red blood cells pumping through our system: the hardworking journalists of 2017. Whether it’s deep investigative reporting, insightful local coverage, or a classic instance of “he-said, she-said,” if there’s anything 2017 taught us, it’s that journalism has reached new heights of relevance, prestige, and principle. Especially cable news, which has never been more informative according to the latest research (which I saw). In a year with as much disruption and general excellence as 2017, is it any wonder ideas came to the fore? It’s been generations since we saw a year in which ideas — pure thoughts culled from the collective mind of human ingenuity — played as large a role as they did in 2017. From dystopian tales like “The Milkmaid’s Adventure” to emotional dramas like “We Are Us,” from blockbuster epics like “House of Swords” to cutting-edge comedies like “This Show Isn’t Funny,” 2017 was the year television grew up … and showed us all a little something about growing up, too. What is our shared experience of life, if not our culture? And what is our cultural life, if not the moments that define us? If culture is the mirror through which we see ourselves and make sense of things, then cultural moments are those bright flashes when the mirror shines brightest and offers the clearest reflection. Sometimes all it takes to make sense of our current situation is a movie or TV show (or song) that helps us see our lives as they really are in the present — the good and the bad parts of them … and of our life itself, in these moments. This is why watching movies and TV and listening to hit songs is never a waste of time — because at any second we could find ourselves in a new cultural moment that lends deeper understanding to the world in which we live, and that moment will have arrived via the pop culture we consumed. From athletes to coaches to the guy at the end of the bar, 2017 was the year everyone seemed to have an opinion about sports. 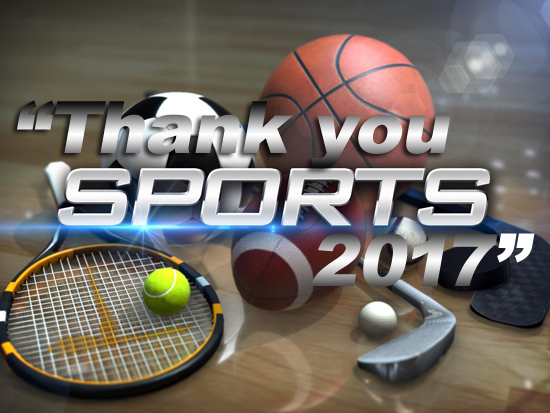 Whether you watched live or on TV, sports were an undeniable presence this year, and definitely had something for everyone. In divided times such as our own, sports can bring us together — allowing us to put aside our differences and “root for the home team, root root for the team, rah rah” as the old cheerleader song goes. And that’s the power of sports: They give us something to believe in. Athletes at peak condition are models of grace and excellence, and we need these exemplars more than ever. And so we love sports and we are all better because of the sports we loved in 2017. The sheer competition of sports will never be beat.